Guru Amar Das began life as a devout Hindu. He grew up to be a devotee of the Hindu deity Vishnu. Amar Das married Mansa Devi and had a daughter Dani. His brother, Manak Chand had a son, Jasoo, who had married, Amro, Guru Angad Dev's elder daughter. At the age of 61, Amar Das overheard Amro singing the hymns of Nanak and became a follower of Sikhism. Amar Das presented himself to Guru Angad Dev in Khadur and became an ardent devotee. He carried firewood and water for the guru's free kitchen from Goindwal to Khadur every day. Amar Das had another daughter, Bhani, and two sons, Mohan and Mohri. Guru Angad Dev requested Amar Das to move his family to Goindwal, and stay there nights so that he would have to carry water only once a day to Khadur. Amar Das tirelessly served the Sikh congregation for 12 years. His selfless service earned the trust of Guru Angad, who when he died at age 48, appointed Amar Das, age 73, to be his successor, and third guru of the Sikhs. 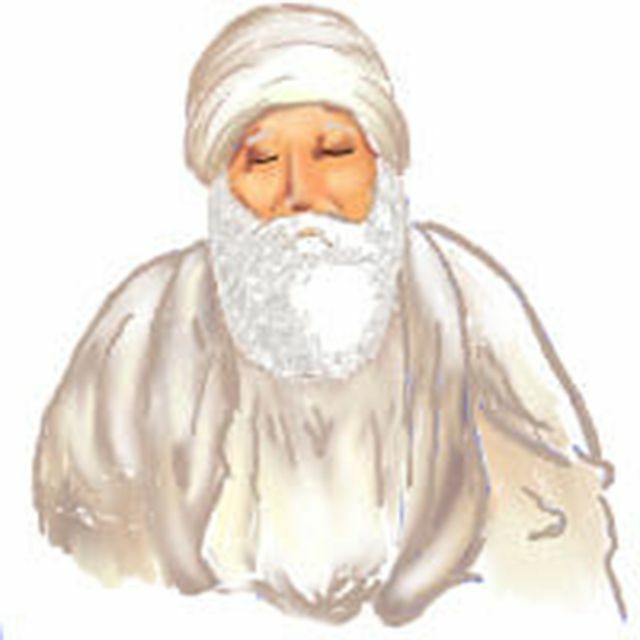 Angad Dev's younger son, Datu, claimed the succession for himself and challenged the authority of Guru Amar Das. He told the elder man to leave and then kicked him with his foot demanding how he could be Guru when he had been only an old servant. Guru Amar Das humbly soothed the angry young man replying that his old bones were hard and may have hurt him. Amar Das retreated and shut himself away in deep meditation. He hung a sign on the door giving notice that anyone entering the door was no Sikh of his, nor would be their Guru. When the Sikhs discovered his whereabouts, they broke through the wall to request their Guru's presence and leadership. Guru Amar Das and Mata Khivi, Angad Dev's widow, worked together to carry on the tradition of langar, free meals served from the guru's communal kitchen. He decreed that all who came to see him should be first fed and implemented the concept of "pangat sangat," nourishment of both body and soul, insisting all people sit together as equal without regard to gender, rank or caste. The Guru uplifted the status of women and encouraged them to discard the veil. He supported remarriage and denounced the practice of sati, a Hindu custom compelling a widow to be burnt alive on her husband's funeral pyre. During his years of service at Goindwal, Amar Das helped to found a township. When he became guru he moved stopped going to Khadur daily and moved to Goindwal permanently. He constructed a well having 84 steps on the river bank to serve the people's needs for water. The guru also established Manjis, or seats of Sikhism, by province. During his lifetime Guru Amar Das penned 7,500 lines of inspirational poetic verse, including Anand Sahib, which later became part of the scripture in the Guru Granth Sahib. He appointed his son-in-law, Jetha, to be his successor and named him Guru Raam Das, meaning "Servant of God." Birth: Basarke – May 23, 1479, Amar Das is born before the dawn of the 14th day of the waxing moon in the month of Vaisakh to mother, Lakhmi (Bhakat), and father, Tej Bhan. What Is the Well of 84 Steps?